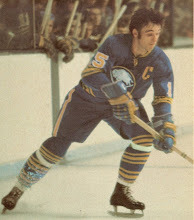 The Gerry Meehan Archives: The Historic Goal That Made Meehan a "Flyer Killer"
The Historic Goal That Made Meehan a "Flyer Killer"
"In 1972, Gerry Meehan of the Buffalo Sabres scored a goal with four seconds left in the season finale that knocked your team out of the playoffs. Clarke told me you went down into the dressing room after the game and told the players, 'Don’t worry, we’ll be the stronger for this.' True story?" Meehan's goal made me a hockey fan forever! It also got my Penguins into the playoffs at the expense of the Flyers!